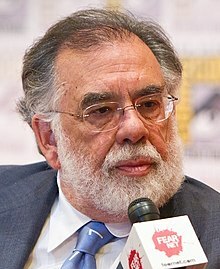 ^ Francis Ford Coppola's commentary on the 2008 DVD edition "The Godfather – The Coppola Restoration"
^ IMDb Top 250. IMDB. [2008年10月9日] （英语）. ^ Jon E Lewis (编). New American Cinema. Duke University Press. 1998: 14–17. ^ 賀恩, 馬可斯·. The Cinema of George Lucas. New York City: Harry N. Abrams Inc. 2005: 46. ISBN 0-8109-4968-7. ^ （英文）．美國電影學會．"Citizen Kane Stands the test of Time"
^ AFI's 10 Top 10. 美國電影學會. 2008年6月17日 [2008年6月18日]. ^ The Godfather (1972) - Box office /business. IMDB. [2007年8月23日].